Want to do it in 4 days? The FreeFLO Challenge is 4 days of intense course planning like the pros do. Using a combination of educational psychology and technology, this system results in online courses with Focus, Longevity, and Outcomes. Day 1 is about setting up your space to help you focus and complete the challenge. Day 2 gets you speaking and (more importantly) listening to your potential students. Day 3 is the meat and potatoes - map out your journey, your course content, and your unique activities. Day 4 sets you up with an action plan so you can keep the momentum, stay in the flow, and finally launch a course that stands out in your industry and gets real results. 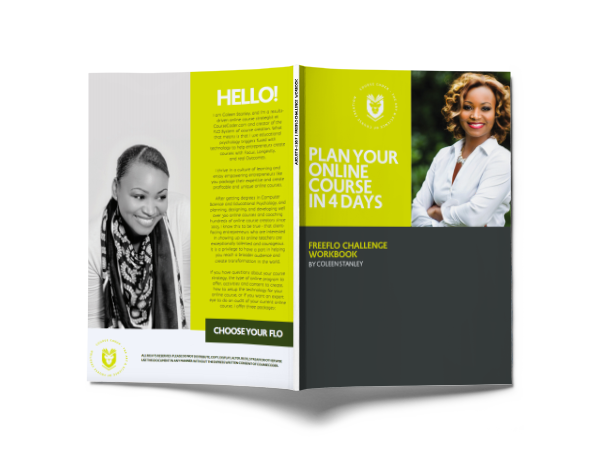 Before I took the FreeFLO challenge, I had no knowledge of the specific steps I'd need to create a course, just a general idea that was too vague to take any further. I appreciated the way the FreeFLO challenge led by example, and made very clear the individual steps towards turning my idea into reality. I'd happily recommend the FreeFLO challenge to everyone who wants to create their own course, but needs a helping hand from the bottom up. It's extremely motivating, but best of all, genuinely informative - it's unbelievable what you can achieve in only four days! Many people are intimidated by the idea of creating their own online course... and maybe you feel the same way. Isn't it too complicated, too technical, too time consuming? It is when you don't have a strategy and when you are just frankensteining everything together. In this free challenge, you will learn a strategy for creating online courses that makes all the other steps easier. Learn to use psychology to trigger your students into a state of flow so they will complete your course and get results. Use the course workbook to create your custom student roadmap. No cookie cutter formula here - your course will be unique.